When we think that which one is important for a successful blog, of course it's content But The only thing which your readers notice before reading your blog content is the images used in the article/content. Images are one of the best way of sharing information around the online world. Each day thousands of photos get uploaded on the internet, and more than a million likes and shares are done on Facebook for images. The above given information clearly shows the importance of photos on the internet. I have personally seen that a lot of bloggers ignore the importance of images and they do not add images in their blog posts which will have a drastic impact on the engagement of their blog. Whether you’re a blogger, a designer or an Advertiser, Everyone needs high quality royalty-free photos. But what if you couldn't make photos for your blog post? What if you are not an illustrator? What will you do now? In that case the best option is to get some services which provides you lot of professional images that you can use in your blog. Today we are going to see one of such service called Depositphotos. Depositphotos is one of the fastest-growing microstock agency in the world which have a collection of over 16 million stock photographs, vector images, and videos. Everything will be sold under royalty-free licenses. It has over a million satisfied customers. Being a creative content marketplace, Depositphotos allows everyone to buy and sell high-quality stock photos, vector images, and videos. As I said above, whatever you are a blogger, a designer, a photographer or anyone who need stock photos in their fields, Depositphotos will be the correct solution, It has a huge collection of photos to satisfy all your designing and photography requirements. Apart from this the following are some of the features it has. Free Stock Photos for Bloggers!! Depositphotos is currently running a bloggers program for any site owners who are looking to use premium images on their site. If you're a blogger, you have the chance of obtaining a free subscription from Depositphotos for your personal use, or for holding a give-away for your readers. All you have to do is, write a well-written review for Depositphotos on your blog/site, and then follow the instructions given in the link above. This is an excellent opportunity for any bloggers out there who would like to start using stock photos but don’t have the fund to pay for the images on an individual basis. In addition to the bloggers program, Depositphotos also has an affiliate program that pays you for referring photographers and stock photo buyers to their site. They offer three ways to earn from their affiliate program. 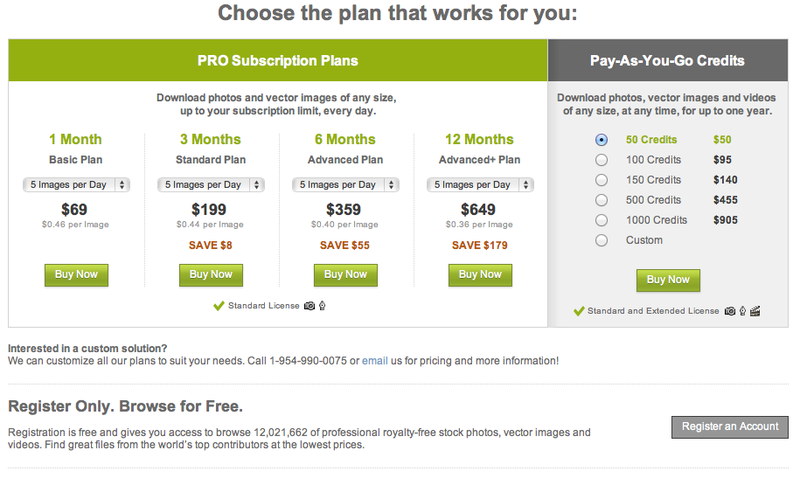 Banners: Bloggers who have photography-related websites/blogs can get $10 for putting up Depositphotos banner on their site. If the site has an Alexa ranking of below 50,000 then it'll be 20$. Commissions for referring Contributors: you'll get $0.03 for each sale made by the contributor you referred. That means the more you refer, the more you earn! Commissions for referring Buyers: You will earn a 15% commission for every Pay-by-Credit purchase your Referral makes. Your commission is based on sale price of the file minus the Contributor's commission. For more details Visit the Depositphotos affiliate program. The Pro Subscription Plans offer the chance to download a set amount of images on a daily basis, while the pay-as-you-go plan offers the chance to purchase a set amount of credits that can then be used to purchase individual images and videos, finally they offer a custom solution. You can see their subscription page for better understanding. Depositphotos offers a verity of payment options, you can make your payment through PayPal, MoneyBookers, or Webmoney. In the end I will conclude that Depositphotos is a best service that bloggers and photographers must go for. As they really provide an excellent platform to share images with each other and that too in an affordable cost. Very nice and informative I will Subscribe for free subscription service to get some premium images. Ya , Many Bloggers are still taking images from Google which is copyrighted ! Even i am a new Blogger , Even I Know this ! thanks for sharing this awesome post....! !